I located the flag of the STA at <www.sta.gov.ua>. Symbols of State Tax Service of Ukraine were adopted by President L.Kuchma on 23.07.2001 (Decree No 466/2001). Emblem: Green round field with yellow Caduceus and oak-wreath around it. The field have yellow border. Presidental decree No 554/2003 (dated June 27, 2003) changed design of flag and emblem of the Ukrainian Customs Service. New flag is green, with blue and yellow strips in canton and yellow emblem in the fly. The new flag of Ukrainian Custom Service was appointed in April 4, 1997. It is dark blue with Ukrainian state flag in th canton and yellow caduceus in the fly. The winged staff of Hermes is the emblem of custom services. The Customs Flag was adopted by Decision No 181/97-BP of Supreme Rada (Parliament) of Ukraine on 4, April, 1997. Ratio 3:2. The height of the emblem = 2/5 of flag-height. Author of the flag - professor V.Shostya. According to L'Album 2000 [pay00] - Customs Ensign (---/-S- 2:3) - Blue enisgn with the national bicolour in the canton and yellow caducees (winged staff with two serpents) in lower fly. I used the pattern of the caducees from the Ministry Emblem on by Jaume Olle. The embem used in Album is somewhat slightly idfferent artisticaly. I don't know if the difference is significan. According to Album 1990's issue Corr. 29 [pay97b] - Customs Ensign - Blue Ensign with the national flag with simplified coat of arms in its midde in the canton defaced with a yellow Caducee in fly. As no image of Caducees is given, I show it as in 2000 series. Note on the page says for this flag to be unconfirmed, especially inclusion of CoA is questionable. The head of customs. Oak leaves are still there with medical staff symbol in the center. The background is green in 1:1 ratio. The fringe is gold. Introduced in 2001, date unknown. It is not a medical staff, but Mercury staff, as see by the wings in the upper part - the symbol of trade and merchant-craft, consequently in many places also became the symbol of such services that have supervision on trade - customs and taxation services and like. 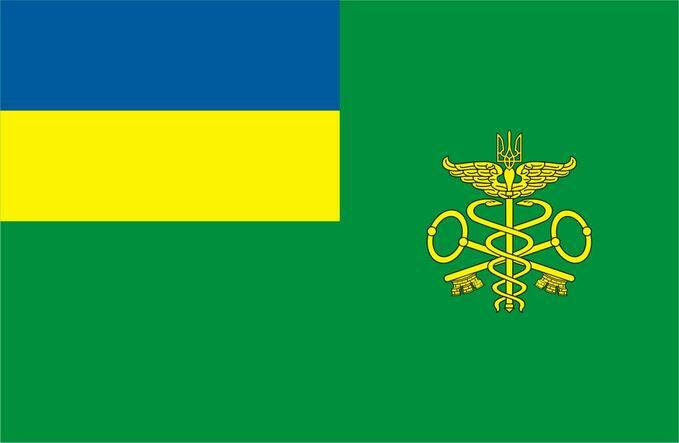 As it seems from <www.sta.gov.ua>, this gonfalon-like flag is the standart of the head of the State Tax Administration. Symbols of State Tax Service of Ukraine were adopted by President L.Kuchma on 23.07.2001 (Decree No 466/2001). Standard of Head of the Service- Green square field with yellow Caduceus and oak-wreath around it. Height of the Caduceus equal to 2/3 of width of Standaed Reverse side is plain green. Detailed image of the emblem in the Ukraine Customs flag as appear in Znak 21.